Introducing the possibility of superb high energy performance from a metal dome tweeter and the smooth response from a silk dome tweeter now all in one unit HD-1A/BL. Housed in a new wide range dispersion anodized aluminum bezel and special designed wide dispersion front horn housing. 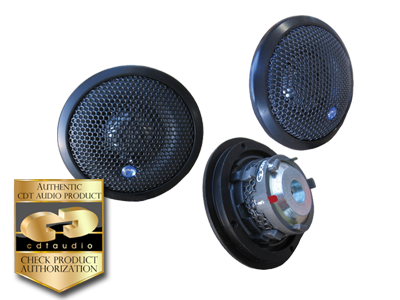 Wide dispersion never heard of before in a mix material top high energy/smooth performance tweeter. The HD-1A/BL tweeter driver is very airy with the smoothest power response. The aluminum is sweet and forgiving and more energy response at the top end. Your smile will stay on forever. Super power handling to match any high-end high powered installation. HD-1A/bl is designed around a neodymium ferro-fluid cooled magnet structure. Frequency response 1500Hz - 21.000Hz. Impedance 4Ohm. Power handling 190Watt or even more when used with CDT designed crossovers. The HD-1A/BL is a unique audiophile tweeter, specially designed with a virtually transient perfect ferromagnetic oil-cooled driver, yielding the smoothest, most gently contoured and pleasant sound. This driver is optimized for all automotive sound systems and of course integrates perfectly with other CDT components. The lucky listener is transported to sound-system heaven. For those in pursuit of that elusive live music sound, the search for the perfect tweeter is over. I use the HD-1A/BL tweeter along with the HD-2 mid/tweeter. The plucking of guitar strings, the snap of a snare drum, the crash and decay of cymbals, it all sounds like you’re in front of the band except you don’t need to deal with the crowd. You have your own perfect spot and your drive has gotten so much less stressful. DRT-26A used to be my favorite tweeter. It’s second on the list now by a good margin. I listen to a variety of music, but most times I go to metal or rock. It has to have that jolting energy and sizzle. I want to be reminded of the band’s passion and sweat that brought the music to me. If this gets your heart going you and puts a smile on your face you will love this tweeter. “I don't have any audio installed in my car right now as the car is still under restoration and in the process of starting the prep for paint. I dug out all my audio components: Exodus Anarchy, CDT ES-04 and the new tweets. I hooked up my Clarion DXZ955MC, awesome deck, and one of my amps. The Jl Audio 450/4. All of this is sitting on my desk playing right now. It is in no way playing in an ideal situation or have any tuning done to it in this arrangement. This is not an ideal situation to hear audio, but it does give me an impression of the sound they will reproduce. WOW!!! These tweets do all that I had hoped and expected them to do. They are VERY crisp, detailed and airy. They are smooth as well, even for metal domes. I will say there is a tad bit of harshness to them, especially on-axis. I expected that and wanted that, though. Coming from having played in a band, music is harsh in a live environment. A cymbal crash, live, will kill your ears. That is what I was looking for. I like metal domes over soft because I can tune out the harshness metal domes are typical of. However, don't let my explanation of harshness to be a turn-off for these. The harshness I'm experiencing is one: the nature of them just sitting on my desk with absolutely no tuning and not in a car environment. I feel the soft domes would not allow me to have the ability to do the tuning for the sound that I like. As I said before, I like my tweets to be on the bright side. I'm going to do a quick install in my car, still won't be the ideal installation because there will be no interior in the car or sound deadening, but I'll get a better impression of them still. I'll inform you further of my impressions after that quick install and once I get the car back together within the next couple months, then I'll give you a full impression. So far, these are the best tweets CDT has ever made and better than nearly any set I have ever heard on the market. I've heard a lot of tweets in my day and these are bout the best.